With the VT-49 Decimator Expansion Pack, you can bring a single VT-49 Decimator to your Galactic Empire squadrons. 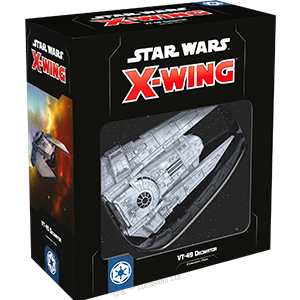 In addition to one pre-painted and finely detailed VT-49 miniature, you’ll also find three ship cards matching the VT-49 Decimator ship cards from the Galactic Empire Conversion Kit, as well as a selection of thirteen reprinted upgrade cards, giving you the freedom to add vital crew and deadly devices to your ship. Finally, two Quick Build cards let you get your Decimator in the fight right away with predefined combinations of ship and upgrade cards.